4 Visual Employee Appreciation Ideas! It’s not just a visual world we live in; those visuals are almost must-dos in the workplace. Your staff wants to be recognized, honored and supported. We’ve come up with four visual employee appreciation ideas that will be well-received and talked about around the water cooler and beyond! We’ve all seen those “employee of the month” photos in frames inside grocery and big box stores. Or, those wooden plaques with small metal engraved name tags. But, what if you expanded on that a bit? 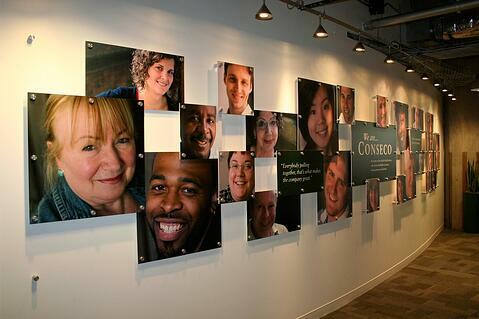 Go bold and big and gain happy employees with a unique employee wall of fame. 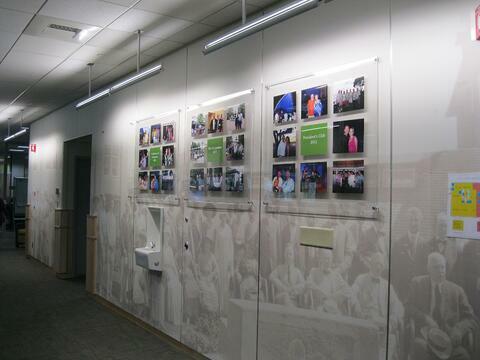 Think about mounting acrylic boards with stand-offs and using vinyl lettering to recognize each employee. It's not so much the images you need. 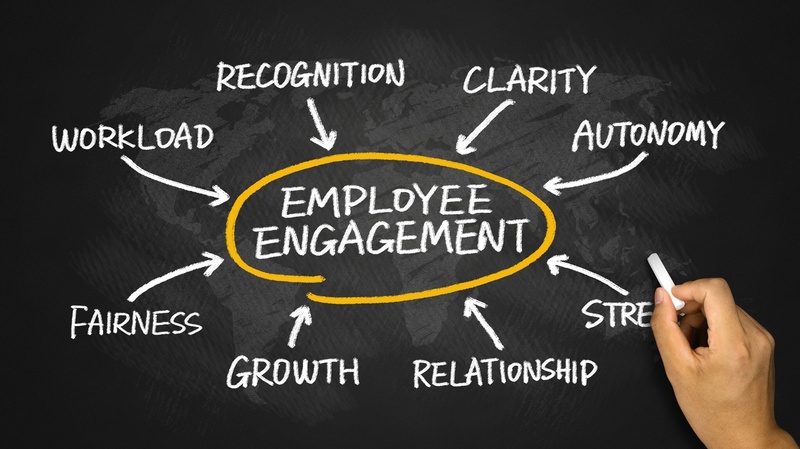 Name recognition goes a long way when it comes to employee engagement. This type of visual will also help you brand your corporate offices by including the name of your company and corporate logos. Employees are fans of graphics that promote them. Consider employee banners that mark years of service or other achievements. Our in-house graphic artists can use your artwork and design these banners using the image of the employee and any content you wish to include. Today's workers want workspaces that are inviting. Why not let them do so with custom banners that reward and recognize? Gratitude boards can be fabricated in a number of ways. The one above is simply a wall mural with vinyl lettering where companies can thank staff for a service or just about anything. A supervisor can write a note or a co-worker can thank another. Another idea is to dedicate a wall in the employee break room and add dimensional lettering. Place "thank you cards" to an acrylic holder on the side for easy access. These can also be impressive in training rooms or think tank areas. If you really want to offer a shout out to your staff, put gratitude boards in your lobby. There are a variety of ways you can create visual employee success stories. While announcing a special achievement in the company newsletter is nice, consider a wall full of high-resolution photos of your employees. 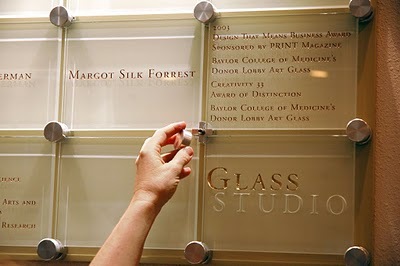 Connect photos with acrylic boards with vinyl lettering to highlight their success. Another option is to add a wall mural and acrylic board with images of your staff showing their success story in the middle of the board. This makes for quite the display in hallways, conference or training rooms - even lobbies. These four visual employee appreciation ideas are all great ways to show your gratitude and support to your hard-working staff. And, visuals and fabrication of achievement walls or success stories are yet another product you can get from signage professionals. 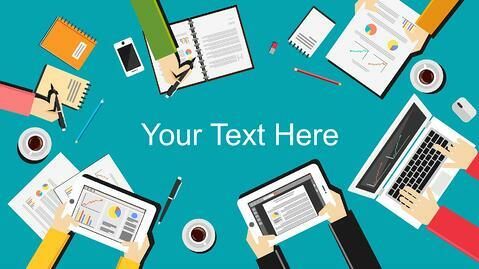 Ready to engage your employees visually? Link to us on LinkedIn!